We are big fans of remote networking (we have an office where some of our team sometimes base themselves). So I was very keen to read the new book from 37 signals. What is it like? 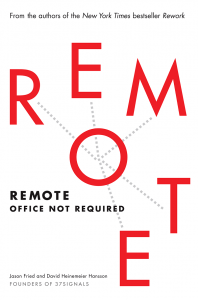 Remote – office not required is actually four books in one. Firstly it is a ‘manifesto’, explaining the benefits of remote working and refuting all the arguments made against it. The book actually starts with the recent decision of Yahoo to ban it, and debunks all the arguments made against it. In most cases, Remote working is not the real issue – it is questions of trust, control and openness. To work well, remote networking forces companies to asses (and often change) at how they organise, motivate, control and assess their staff – painful and introspective actions which are often easier to just ignore. Secondly, the book debunks the myths of what Remote Networking is not. It is not necessarily having a office, or no office, working on your own or always working from home. It is far more varied and subtle. Thirdly, it is an set of examples where companies are using Remote Networking as a major business advantage (reducing costs, improving hiring, creating more resilient organisations with more motivated staff). It includes not just 37signals but a whole host of other examples such as IBM. Fourthly, it is a guide on introduce remote working into a company and how to make it work. There are lots of tips and recommendations of tools to try. For example, if possible you need a decent overlap window (say 4 hours) so that people can connect. And a virtual water cooler where people can gather and chat. As I worked through the book, I made a list of key points. I do really recommend you read (or listen) to the whole book. It is worthwhile. 2. A lot of time is wasted commuting (400 hours a years which is how long it took 37 Signals to code their product Basecamp). 3. It is now viable to work remotely. 4. Most companies need to work flexible hours anyway to get job done (ie overseas customers, deadlines). 5. If you need to provide fixed hours (ie someone on support at certain hours), this is a time-tabling issue, not an excuse to make everyone work those hours. 8. People still need structure and social element. Boundaries are still needed. 12. Does not work for all (ie some people will need to be onsite). But why limit everyone else? 13. Many objecting are actually over a loss of control. 15. All files need to be shared so everyone can access. 16. People are judged on work done. 18. It makes the organisation far more resiliant. 19. When people are judged by what they do, it is all out in the open. 21. Overwork is more of an issue than underwork. 22. You must avoid work becoming your hobby. You can find out more about the book on 37signals website. There is also an excellent audiobook version read by Rebecca Lowman. And 37Signals are running a brilliant parody of Microsofts flawed advertising campaign. What are your experiences of remote working?